According to SCAR’s Strategic Plan, Scientific Research Programmes (SRPs) are its flagship science facilitation activities. Currently, six SRPs are underway and will conclude at the end of 2020. These SRPs have modest budgets of US $21,000 per year. 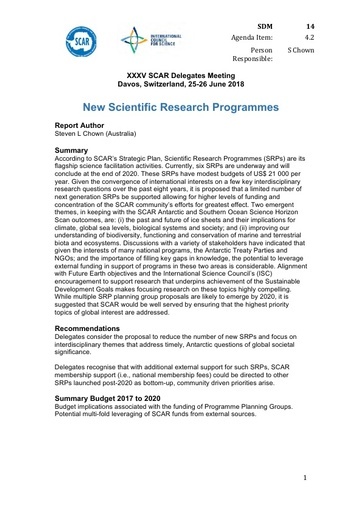 Given the convergence of international interests on a few key interdisciplinary research questions over the past eight years, it is proposed that a limited number of next generation SRPs be supported allowing for higher levels of funding and concentration of the SCAR community’s efforts for greatest effect.Two emergent themes, in keeping with the SCAR Antarctic and Southern Ocean Science Horizon Scan outcomes, are: (i) the past and future of ice sheets and their implications for climate, global sea levels, biological systems and society; and (ii) improving our understanding of biodiversity, functioning and conservation of marine and terrestrial biota and ecosystems. Discussions with a variety of stakeholders have indicated that given the interests of many national programs, the Antarctic Treaty Parties and NGOs; and the importance of filling key gaps in knowledge, the potential to leverage external funding in support of programs in these two areas is considerable. Alignment with Future Earth objectives and the International Science Council’s (ISC) encouragement to support research that underpins achievement of the Sustainable Development Goals makes focusing research on these topics highly compelling. While multiple SRP planning group proposals are likely to emerge by 2020, it is suggested that SCAR would be well served by ensuring that the highest priority topics of global interest are addressed. Delegates consider the proposal to reduce the number of new SRPs and focus on interdisciplinary themes that address timely, Antarctic questions of global societal significance. Delegates recognise that with additional external support for such SRPs, SCAR membership support (i.e., national membership fees) could be directed to other SRPs launched post-2020 as bottom-up, community driven priorities arise. Budget implications associated with the funding of Programme Planning Groups. Potential multi-fold leveraging of SCAR funds from external sources.